So, I’ve shared with you that bone broth isn’t particularly mineral-rich despite what you may have read elsewhere. Many nutritionists and home cooks recommend adding apple cider vinegar to their bone broth, in an effort to help the bones leach their minerals into the broth, doing so doesn’t provide any particularly notable improvement in mineral content. 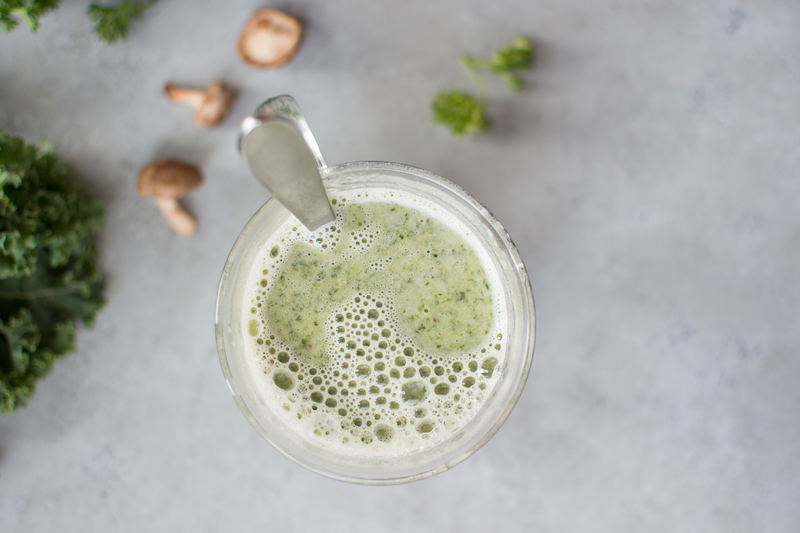 But, there’s a few things you can do to greatly improve the mineral content of your sipping broths, and increase the mineral content of your diet overall. Nope, Bone Broth isn’t rich in minerals. But here’s why it’s good for you. Since bone broth is made from bones, it’s commonly believed and repeated that it is a mineral-rich food. While bone broth does have a modest boost of minerals, it’s not particularly mineral-rich compared to other foods. It is, however, a particularly good source of gelatin, an easy-to-digest protein, that comes from the the collagen-rich tissue that dissolves when you make broth. The gelatin in broth is what makes it a particularly good food to make at home or keep on hand, as gelatin is easy to absorb, easy to digest and supports skin, hair and joint health. If bone broth isn’t rich in minerals, what’s the best way to add minerals to your broth? While bone broth isn’t rich in minerals, despite being made from bones, and while vegetable broths aren’t notably richer in minerals than bone broths, there’s still some great ways to boost the mineral content of your sipping broths. That way you’ll ensure you not only absorb plenty of protein, but plenty of minerals too. The best way to add minerals to your broth, is to make sipping broths and soups that contain whole vegetables, pulses, nuts and seeds or dairy products. Even better, make sure that those foods remain in the broth and are not strained out. 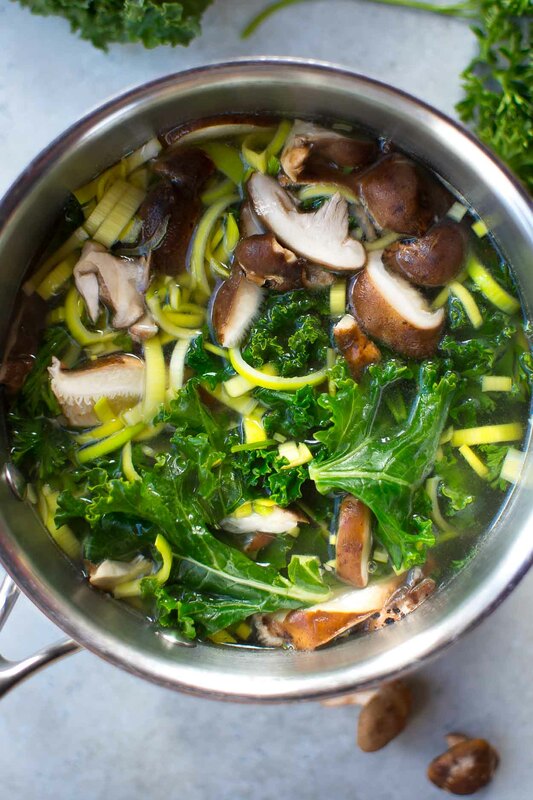 In the recipe below for a mineral-rich sipping broth, I’ve used kale, mushrooms, tahini, miso and a trace mineral supplement. Leafy Greens, like kale, are a good source of manganese, a mineral that supports the health of connective tissue, helps to regulate blood sugar, and supports brain and nerve function, among other roles. Mushrooms, like shiitakes, are good source of selenium, a micronutrient that helps prevent cell damage, and zinc, which plays a role in hormonal health, fertility and the immune system. Seeds and seed butters, like tahini, tend to be incredibly mineral-dense. Tahini, which is made from sesame seeds, is particularly rich in calcium, magnesium, phosphorus and zinc. Alliums, like leeks and onions, vary in mineral density, but tend to provide modest boost of minerals like iron and potassium. They’re great to include because they contribute a well-rounded flavor. Dairy products, like cream or parmesan cheese, provide a nice boost of calcium to soups and broths. Unrefined salt not only improves the flavor of your foods, but it also contains trace amounts of minerals that you’d normally find in seawater, like iodine, sulfur, lithium and others. Trace Mineral Supplements, like Concentrace, can help to fortify sipping broths with trace minerals that are otherwise difficult to get consistently through food or municipal water supplies. In addition to calcium, zinc, phosphorus, you’ll typically find molybdenum, iodine, and chromium among others. Mineral deficiency is common, and contributes to poor bone health, poor immune system function, fatigue, muscle cramping, headaches and a host of other issues. Less than half of the American population consumes the minimum amount of magnesium to maintain health (read it here). Minerals play a critical role in health, with traditional diets absent of processed foods contained four times the mineral content of modern diets as outlined in the landmark book Nutrition and Physical Degeneration. Moreover, some of the healthiest and longest lived people in the world currently consume vastly higher amounts of minerals, through their food choices and their water supply, than do most of the world’s population, particularly those living in western, urbanized settings (source). Delicately flavored with leafy greens, leeks, shiitake mushrooms, tahini and misoi, this sipping broth is rich in both minerals and protein. You can sip it on its own, as a light meal or snack, or serve it as a starter before a larger and more substantial meal. Toss all the vegetables into a medium stock pot, and then pour in the chicken broth. Cover the pot, and bring to a simmer over medium-high heat. Turn down the heat to medium-low, and continue simmering the broth and vegetables until the kale wilts and turns bright green, about 8 minutes. Remove the pot from the heat, stir in the tahini, miso and trace mineral supplement. Blend with an immersion blender until smooth. Salt the sipping broth as you like it, and serve it warm. 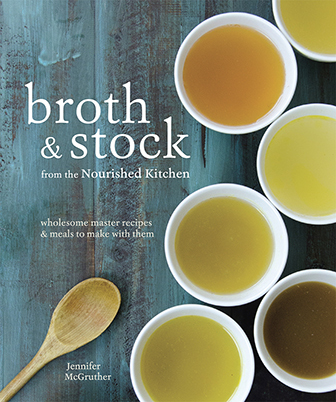 Slowly simmered bone broths and stocks are one of the foundational elements of wholesome and balanced cooking of a nourished kitchen. They’re particularly rich in gelatin, an easy-to-digest protein that supports gut and skin health. 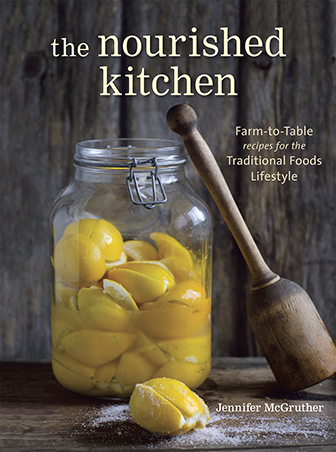 You can make your own slowly simmered, gelatin-rich bone broths with the recipes in this cookbook on Broth and Stock. Or, if you’re short on time, you can buy traditionally prepared, slowly simmered gelatin-rich bone broth online here. One of the best ways to build upon the rich protein of your bone broths and stocks is to include vegetables and pulses like lentils into the soup pot. Where bone broth brings protein to the table, pulses and vegetables will bring minerals and loads of flavor, too. You can see all Nourished Kitchen’s soup recipes here, or take a look at some of our favorites below. Sprouted Lentil Chili is easy to make, super filling and rich in minerals and protein. Salmon Chowder combines wild-caught salmon with creamy potatoes and fresh dill for a gorgeous, simple dinner. Scotch Broth is a humble, but gorgeous blend of slowly simmered lamb shank and split pease with kale. And it’s deeply satisfying. Hi! Love this sipping broth! How long would you say it would keep fresh in the fridge? Or better to freeze in servings? You may have mentioned it above, but I don’t see it. Love your blog! Thank you! You could probably keep it in the fridge for a couple days, stir it well and reheat on the stove. Thanks for the information on making mineral rich bone broth. I have a question: the link you gave for the tahini is currently not for sale. Do you have any other options you would recommend for tahini? Also, does it matter whether the tahini is roasted or raw? Try this link: http://amzn.to/2ydK46R. Use tahini that meets your preference. Tahini (sesame seed) has a huge amount of phytic acid that will bind the minerals and chelate them out of the body. Is there something I am missing here? First, food phytates bind minerals in their foods, but won’t chelate them out of the body. What they do is make those minerals in food insoluble. Second, and this is important, cooking, and specifically roasting or toasting, largely deactivates food phytate, rendering those minerals more bioavailable. Other methods to improve bioavailability include soaking, souring and sprouting. Outstanding informative article and recipe. I’ve been studying nutrition for a few years and lately bone broth is to popular. Didn’t even realize how to make a mineral broth which is so important to our health. Thanks for your this insight. This sounds wonderful!! What are the macros?? We don’t provide macros. If you need them, plug the ingredients and servings into the calorie counter of your choice. Which miso paste do you recommend? Prefer one not too sweet. I typically use organic white miso paste. I just made this for the first time. It was delicious. I might never drink plain bone broth again! Jenny, thank you for this! And, thank you for looking out for us. Given the difficulties in getting properly nourished these days, I truly appreciate your efforts in helping us eat healthier. I look forward to making it! Jenny thank you so much for this. I have been looking for a way to consume minerals from the past few days and lo behold I see your email in my inbox today for the exact same thing i was searching for. Thank you so much. Thank you for this recipe. In my country we make lots of bone broths.. and now that I am dealing with cancer, I have for some reason been craving such broths, to the point i had asked my neighbor to make me some bone broth, and he being from Laos made it for me with the beef bones, and then the veggies.. I just can tell you this saved me I was absolutely ill, ill, ill, and within a day or two of taking the soup I felt a bit better and you could tell i was revived. So thank you for keep reminding us that we need these minerals.. I love your recipes, thank you kindly and I appreciate your time and input here even so I dont answer or post much I read them..